Sonic Cathedral’s Robin Stryker had the pleasure of chatting with vocalist Sagan Amery to get a preview of what is coming down the line for Hail Sagan. 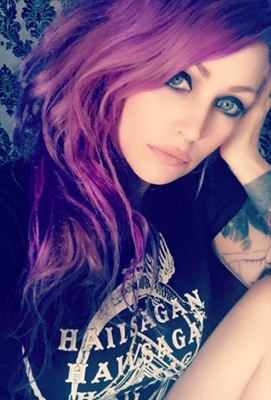 Dive in for an exclusive look at Hail Sagan’s upcoming self-titled EP, tattoos, Sagan’s favorite horror films, and much more! Sonic Cathedral: Sagan, welcome to Sonic Cathedral webzine! Jumping in, how did a former biology major from New York find herself all the way in Los Angeles, fronting a hard rock band? Sagan: It doesn’t really make a difference, but a lot of musicians go to school. So, my area of focus was biology. I did really well with it, and started getting into the pre-med stuff. I was considering going into medical school. But I had always been a musician, and it pulled me in that direction. Even when I would go to school, I was still thinking about music and, in some way, involved in music. I always have been. I played around with different genres of music, and I was always doing something. So, it never kind of went away. Sonic Cathedral: Being across the country in LA, have you been able to find those New York essentials, like good pizza, bagels, and a decent Reuben sandwich? Sagan: <laughs> Okay, so I was born and raised in New Jersey, and spent all of my life in New York City. So, I’m like the New York Metro girl. That area is all what I was born and raised with. Now, LA is so different -- culturally, the people, and everything is so different! I just found out recently that a frozen pizza that I ate my whole entire life … that I thought the whole world (or at least the whole country) ate, and that it was just a part of life that you would eat this particular kind of frozen pizza, which is quite unique and very delicious … I found out recently that it does not exist anywhere, except for where I’m from. That was extremely disappointing and shocking because I really thought it was a national staple -- only to find out that it was just a nice thing to have on the East Coast, or just in the Jersey/New York City area. I recently found a pizza place that ships in their pizza dough from Brooklyn, so that’s really cool. It is probably the closest I’m going to come to that kind of pizza out here. Bagels, no. There is nothing good. Food in general in Los Angeles is really weird. You can find all the most amazing Thai food and Indian food and stuff like that. But when comes down to other options, there aren’t a whole lot of them. Sonic Cathedral: Awwww, it sounds like the comfort foods from home are sorely lacking. Sagan: Yeah, even at the grocery store. Certain types of food that I grew up eating that were just normal … it was just a normal thing … they don’t exist out here, and people look at you like you’re crazy when you ask where you buy it from. <laughs> They say: “Uhm well, I guess you could try an Italian provisions shop or a specialty shop.” I’m like: “What?!? It’s just a normal item.” But apparently, out here, it’s not. So, I’ve been having to learn a lot about culture out here with the food and mannerisms. Everything is just so different! Sonic Cathedral: Hail Sagan recently released the video for “Dark Cloud”, the first single off your upcoming EP. The track addresses bullying, isolation, and self-harm. Why do those themes resonate with you? Sagan: Well, I think everyone has had a brush with bullying in some way, whether it was in an extreme way or just being picked on, or whether it was at school or on the internet. I think people are picking on each other way too much online, especially through social media and stuff like that. Now, people are being pitted against each other for what they look like. I think it’s stressful. I definitely dealt with bullying growing up. I was the kid who was different; I wasn’t a typical, everyday girl-next-door. Instead, I was more into punk music and music in general. I started playing guitar at a really young age, and was into the more abrasive styles, with the colored hair, ripped-up clothing, and things like that. It wasn’t as common where I grew up, so I did get picked on … not just by students, but by faculty at school and other adults. I guess they had a hard time with anyone who was different. My friends who looked the same way, also had the same issues. So, I think it just came with the whole: “If you want to look alternative, you will be judged.” But it went beyond judging. Over the years, I have noticed that bullying is a serious problem for anyone who doesn’t look a certain way. I don’t really know what way you’re supposed to look, but I guess society has this idea of what it is. And if you don’t fit in that, then it is okay (to them) to pick on you or bully you. I look at what my fans post … I don’t always interact with every single fan who posts out there, but I watch what they post on Instagram and Facebook and stuff … and I have noticed a lot of my fans also posting things about bullying, self-harm, and suicide. I have had some people very close to me in my life also commit suicide. So, all those things meant something to me. I didn’t want our first single to just be a video about nothing. I notice that a lot of bands do it, and there is nothing wrong with that. But I didn’t want to just post another video of me standing around with my band, singing into a camera. I thought: “What can I do to make it matter?” Since I wrote the lyrics to “Dark Cloud” about bullying, I thought that would be a good first single to release with that theme involved -- with bullying, self-harm, violence, and things like that. Sonic Cathedral: Switching to a lighter topic, y’all spent time at Metal Sanaz’s Unfriendly Studios in LA, which seemed anything but unfriendly. Sagan: They were so AWESOME. Sonic Cathedral: Tell us about your experience recording there. Sagan: We actually didn’t record there, but we rehearsed there. What is awesome about it is that the reason she calls it Unfriendly Studios is because most music studios are extremely unfriendly. A lot of people don’t know that, because a lot of people have never been in a studio. So, what happens is: If you want to book some time so your band can practice -- or if you want to record, or whatever you want to do in that room you’re spending the money on per hour or whatever -- you call there, and they are the most unfriendly people on the planet. They are just so rude to the musicians. I don’t know why people think it is okay to treat musicians in a horrible way, but it happens a lot. It’s like: “Oh, you’re just a musician. I can treat you like garbage, and talk down to you … even though you’re here to spend money.” That is what makes it really odd; the customer service is lacking in all those places collectively. I have never been to a studio or a rehearsal studio where anyone has been friendly. They are always just really mean. So, it’s really funny when we chose to use her rehearsal studio to do the rehearsal. I was talking to her about that: “It’s so nice how friendly you guys are because everyone is so mean in this industry with rehearsal.” She said: “That’s why we called it that!” It was pretty funny because it’s a known thing that, if you are going to go to a rehearsal studio, not only are they rude to you, but they’ll bang on the door and tell you to get out. It is just really horrible. At Unfriendly Studios, Sanaz is really liberal with the time. Unless she has got something really big coming in, and you have to get out of the way for the next thing, she is really cool about giving you space and letting you take your time to rehearse your stage show or whatever you want to do in there. Sonic Cathedral: From the “Dark Cloud” video, Hail Sagan fans may have gotten a taste of the upcoming self-titled EP. How representative is the single of the album as a whole? Sagan: Hmmmm, it definitely represents an overall sound. You are not going to get terribly off-track in terms of the sound. It is not like you’re going to play it, and go: “What is this other stuff?! ?” However, I would say that the songs vary enough that you’re going to get enough variety. If you listen to each song on its own, you won’t feel like it is more of the same. There are no “filler” songs on this EP -- each song was created to be a single. So, you’re not going to feel like there are two or three hits, and the rest is just whatever we slapped together. Each song got the same amount of focus and creativity put forth towards it. A couple of the songs bend a little bit in genre because, as a musician, I have played with so many different genres. I love all music, and I don’t just listen to metal and hard rock. I listen to EVERYTHING; I play around with everything; and so does Nick, who is writing the guitars and a lot of the other parts of the music. When you listen, you can hear that we definitely have a lot of influences in terms of genres, other bands that we listen to, inspirations, and things we get into. So, I think they will find that some of the other songs have flair that maybe “Dark Cloud” doesn’t, but then, you’ll hear some songs that are similar to “Dark Cloud”. <laughs> You kind of have to listen to it all, and take it in. Sonic Cathedral: I can’t wait! In addition to singing, you started playing the guitar at a very young age, and have played guitars and keys in previous bands. Will fans get a chance to hear your instrumental work, either on the EP or during a live show? Sagan: Oh, definitely! I don’t want to give away too much about the show. But even if it’s not this time around, somewhere along the way, I’ll definitely be picking up a guitar again … but probably not the keyboard. I mean, you never know; it could happen. For me, as a creator and as an artist, I never know when I’ll want to grab something, and try out something. “I want to do THIS today! Or, I want to put this away, and not play it for three months.” That’s just how I am. So, I don’t know. I definitely see it happening, but I just don’t know when. Yeah, in terms of recording, I would love to play around with some songs with the guitar. But on this EP, I didn’t. Nick did all the guitars, but I definitely can see it happening in the future. Sonic Cathedral: Sagan, I can’t think of a way to ask this next question without sounding weird, so I guess I’ll just awkwardly flail. Okay, even by LA’s high standards, you’ve got a beautiful face and a great body. Do you find that people underestimate you -- either intellectually or musically -- because of how you look? Sagan: <sighs> Yeah, absolutely! It’s kind of funny because people who don’t know me just assume that I’m an attractive female musician who doesn’t know anything. A lot of people don’t know that I’m formally educated. But it’s not just the book smarts, I also have one hell of a chunk of common sense. I’m well-rounded as a person, and I think that I’m TOTALLY underestimated in that sense, especially by the male population. I used to get really mad about it, and sometimes I’ll still get mad because it’s offensive. But for the most part, I giggle because I’m so underestimated. It’s like: “Okay, you’re just a girl singer. You just sit down over there, and let us do the hard work.” I’ll stand up, push back, and say: “Hey, I know stuff too.” Then I just prove it. After I prove it, I find that I’m accepted … for the most part. Sonic Cathedral: Congratulations on being signed to the EMP Label Group! Sonic Cathedral: For those who don’t already know, EMP is the record label formed by Megadeth’s co-founder, bassist and producer, David Ellefson. How did Hail Sagan come to EMP’s attention? Sagan: Well, we had been talking with Thom Hazaert, who is the Vice President of EMP. He connected us with David Ellefson. As soon as we played Thom the music and we showed him all the stuff that we had out there online, he loved it, and he thought it was something that David Ellefson would love. They got together and looked at everything, and immediately, Dave said he definitely wanted to work with us. I had a real small conversation with Dave … it wasn’t very long because he was on tour at the time … but he said he really loved Hail Sagan and loved the music. He thought it was great, and was totally into it. So, they signed a deal with us, and they put us on their main label, because they’re got two. They’ve got an underground label, and then their main label. They put us on the main label, and started setting us up with distribution for the EP. We just started working together on all that stuff, so it’s in its infancy because we just signed. So, we don’t have a whole lot of information yet. But it’s been really cool so far! Sonic Cathedral: Judging from your tattoos, I’m gonna take a wild leap, and guess that you are a fan of horror movies. If you were planning a movie night to scare the crap out of your friends, which movies would you pick? Sagan: <laughs> I don’t know if they would scare anyone because I’m not scared of any of these films. I just love them! I would definitely pick Hellraiser. If you hadn’t noticed, my entire left arm is tattooed with Cenobites from the Hellraiser films, so that’s one of my favorite franchises. I especially love the first three films, and then there are a few here and there afterwards that I really like. So, I’d put on Hellraiser. And then, I really love Rosemary’s Baby. I could watch that movie every night forever, and never get sick of it. <laughs> Hmmmm, Night of the Living Dead, The Return of the Living Dead, and Phantasm. I mean, in terms of a scary movie, I think it would have to be … aaaaaah, I can’t remember the name of the movie, but it just came out a few years ago … right, Paranormal Activity. Sagan: <laughs> Yeah! For some reason, that movie really scared me. The first one I saw, when I was in the theater, I screamed out loud. I have never screamed in horror movies because they never scare me. But that’s a really scary movie. I think demons and things like that are creepy. Hmmm, I’m trying to think what else. I like things by Tim Burton, like The Nightmare Before Christmas and Edward Scissorhands. I don’t know if they are really scary because I have a hard time gauging what is scary to people. Sagan: It’s artistic for me. Anything by Clive Barker to me is ART; it’s not scary. I think he is a very artistic person. I don’t think his paintings are really the same as the Cenobite stuff, but I have a collection of Cenobite dolls. I think it’s artistic. <laughs> I have them up on the wall, so to me, it’s not scary. I mean, The Exorcist, everyone is scared of that movie; right? Sonic Cathedral: Oh, hell yes! Sagan: Yeah, that’s not a movie you watch by yourself. I don’t think that even grown men watch that movie by themselves. I don’t think anyone would ever admit that they don’t do it by themselves … that they CAN’T watch it by themselves. But actually, no one can sit in a dark room, and watch that movie alone. <all laugh> I would put that on the list for anyone who maybe didn’t have a relationship with horror movies, and wanted to be scared. The Exorcist is definitely a good one! Sonic Cathedral: Speaking of artistic things, your death’s-head chest piece certainly is a big, bold, colorful piece of art. What does it mean for you? I really loved The Return of the Living Dead, and it was between the Tarman and the mohawked skeleton that popped up when 45 Grave came on with “Do You Want To Party”. I was like: “Well, I like this stuff,” and he was a big fan of the same things. So, we took those things, and he created this piece for me. It didn’t exist before our conversation. The big, giant death’s-head skull is from The Return of the Living Dead, and the rest of it goes along with the idea of Buffalo Bill in The Silence of the Lambs. He actually created a painting based on my tattoo, after that, so that’s pretty cool. But the tattoo came before the painting. I love it! Sonic Cathedral: The day will come when a fan walks up to you, and proudly shows you a tattoo of your face inked onto some part of their body. Will that be a cool moment or an “oh crap” moment? Sagan: I think it would be awesome. I just hope they go to a really good portrait artist because there are a lot of tattoo artists out there who should NOT be tattooing portraits. <laughs> But they do, and you can find those funny things online about tattoo portraits gone wrong. So I just hope they get it done by a talented artist. That would be really fucked if they had a banged-up portrait of me on them. I do have a fan right now whose next tattoo is going to be the Hail Sagan logo, so I’m looking forward to seeing that. I think it’s awesome! I have one band tattoo on me, which is on my leg. I was eventually going to get a whole bunch more, but I never got around to it. I change my ideas all the time. So, if I don’t get them right away, then it is probably an idea that I’m not going to do … or I shouldn’t do. That is how I kind of gauge whether a tattoo is worth it. But I don’t think there is anything wrong with getting band tattoos. I think it’s kind of cool, especially if you make a cool piece out of it, like a sleeve. I’m not going to tell anyone not to get tattooed. <laughs> That would be kind of hypocritical! Sonic Cathedral: <laughs> Maybe just a little bit hypocritical. Sagan: I can’t say “don’t do it”. But I can say to be careful, and make sure you get it done by someone who knows what they’re doing. There are some really BAD tattoos out there. Sonic Cathedral: Something that really stood out for me is how incredibly responsive you are to Facebook fans. Of all the things vying for your attention, why do you choose to invest so much time into social media? Sagan: I think it’s a positive thing because I like to connect. I like to hear what people have to say, and I like to take into consideration what they have to say. Sometimes, I’ll even use their advice on things. I am creating this music for people, and those people are allowing me to be able to continue doing it as a career. So, it would be horrible to ignore those people. I know there are a lot of bands, especially from the past … it’s not so bad these days, I guess … but you still get that whole “rock star” mentality, where people are too good to talk to you because they feel they’re above you. I don’t feel that way. If you have a consumer of your art, I feel like it’s the right thing to do. Big corporations and companies that aren’t at a level where they can talk to their consumers and fans, I don’t think it is very humane. I really love seeing corporations that go out of their way to joke around with their customers online and on social media. They do funny responses to customer requests and things like that. I think it just makes you a human to take a few minutes out of your day and to treat people like they are on the same level. Sonic Cathedral: Hail Sagan are ramping up to start touring, with the EP slated for release in October. From previous interviews, I understand that your live show is something to behold. You guys love lights and fire and spectacle. You can only imagine what our stage show is going to look like! Of course, it depends on the venue and on what we are allowed to do. But at this point, for a band that’s just starting out, it is definitely over-the-top in a good way. I am not a person who just jams out in street clothes. There is nothing wrong with that, if that’s what someone is into. But for me, this is more than just music -- it’s art, it’s entertainment, it’s performance art. So, I need to have the whole package. I need to have the lights and all of the stuff happening. For me, it’s part of the music. I feel like music is not just an auditory thing. It is visual, and it’s a feeling. So, if you’re not really portraying all those things and hitting all those senses, then I feel like you’re doing a disservice to your craft, for me anyway. As an artist, it’s the whole thing, so you need to have the visual. Nick is really big on lighting, and he’s really into all that kind of stuff, so it’s part of his thing too. 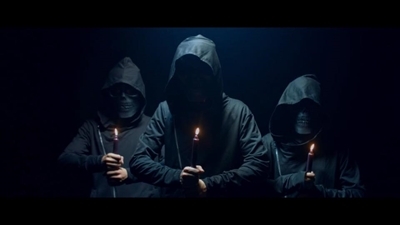 Sonic Cathedral: I’ve gotta ask: What’s up with the creepy dudes in the masks? Sagan: They’re not that creepy! Sonic Cathedral: Mmmmhmmmmm …. says YOU. Sagan: <laughs> I spend a lot of time with them, so I’m not too creeped out by them anymore. The whole thing with the masks is that we wanted the fans and other musicians to feel like they are part of the band, so you don’t know who is behind those masks. There have been some band members named, but not all of them. We are going to have some surprises under there, so you never know who is going to be playing. It might be somebody super-famous that everyone loves and has heard of before from another band. It could be a fan that maybe reached out to us because they knew we were going to be in their city, like: “Look, I play bass or guitar really well. I’ve learned all your songs, and I’d really like to play at your show.” Maybe for one of the songs (or for all of the songs), they’ll be up there under the mask. You just don’t know who is going to be under there. I think that anonymity helps us to create something for everybody. I think everyone knows about Nick, so we can’t hide him. But yeah, it’s just a way to connect with people. Also, it’s theatrical, and I really love the idea. As we go on, I’m sure the masks will evolve and everything like that. I love the idea of the theatrics behind it, and it brings a little taste of Broadway. Being on the East Coast when I was a little younger, it was good to go to Broadway to see Phantom of the Opera. That stuff, I love it, and it touches me. Altogether, because we are all a bunch of artists, we want to do artistic things, so we’re going to keep doing that. Sonic Cathedral: Final words: Sagan’s love letter to her fans! Sagan: You guys are awesome! I love that you reach out to me, and take the time out to tell me how you feel about the music and the video, and the support you have given. It is just awesome that you’re there. I have a lot more for you, so stick around! Sonic Cathedral: Sagan, thank you so much for talking with Sonic Cathedral tonight!